We just got in our new stamped metal license plates from Celebrity Machines. 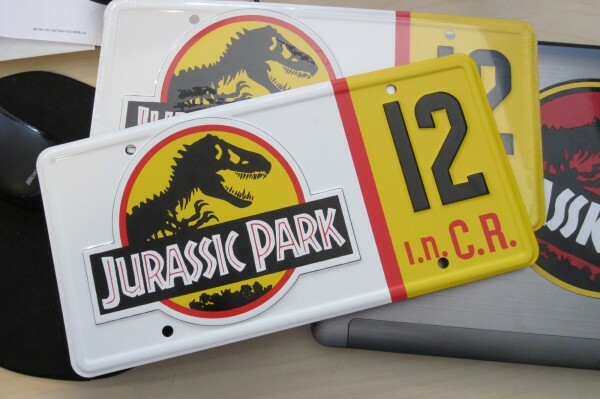 They are absolutely great quality and are by far the nicest replica license plates you will find! 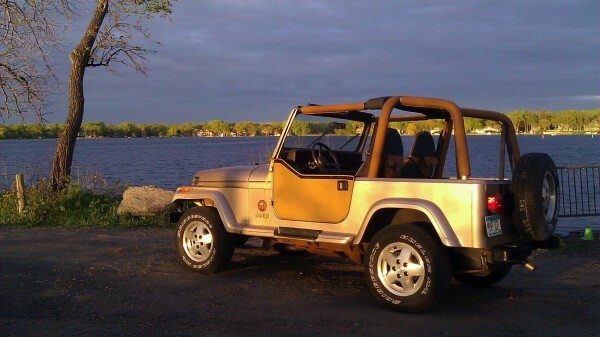 Jeep #12: Work. Work. Work. Hey guys! Its been a long time since I’ve posted an update. Lots of things have happened since the last update. 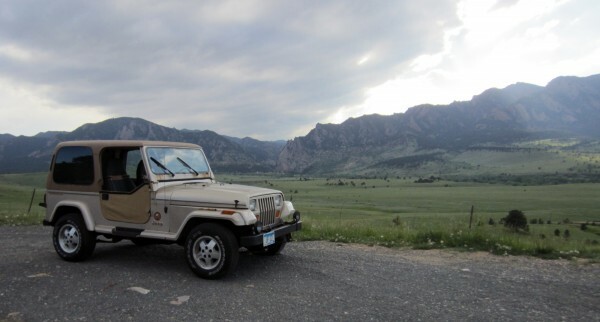 I am now in Denver Colorado with the likes of Boomerjinks and his Jeep #18. We loaded the Jeep up earlier this week and drove 1000 miles from Minneapolis to Denver, through back country roads over the course of 2 days. 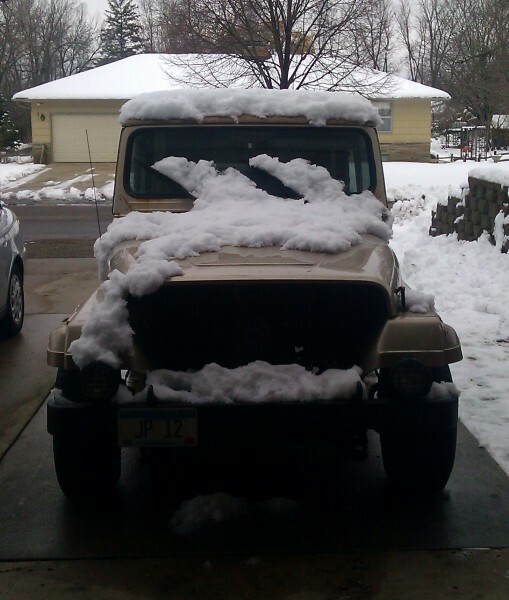 It was pretty eventful for the Jeep. The rear brake lines burst somewhere in Nebraska, and we drove the remaining 450 miles with limited (front) brakes. Then somewhere in Colorado, the fuel pump started to whine and go out. Once it was back together we decided to take it out into the mountains and up to Boulder Colorado for the night. 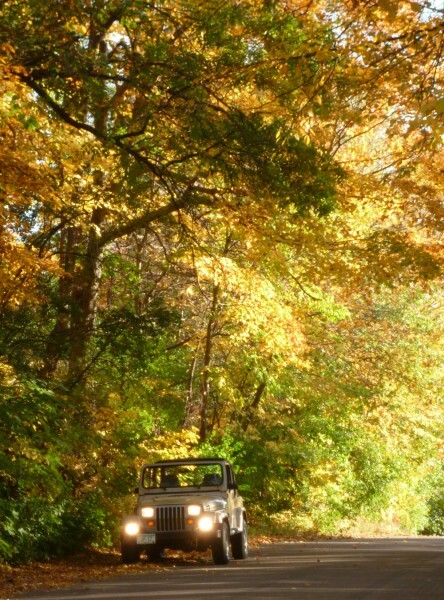 While stopping into this scenic overlook the Jeep took a pretty big hit and damaged the front suspension. The sway bar bracket broke, as did something else that has yet to be identified. (It can be heard but not found yet.) 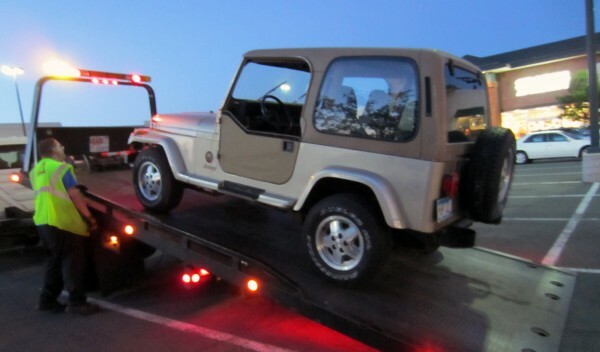 We attempted to drive back from Boulder, but ultimately had to get it towed. 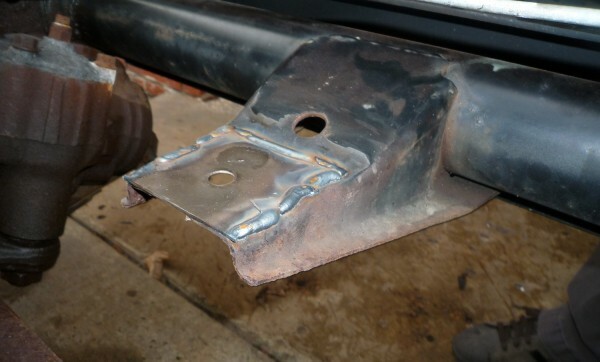 It was very ironic that we drove hundreds of miles on broken brakes and a failing fuel pump… but one $5 bracket was what stopped us from driving home. The good news is. 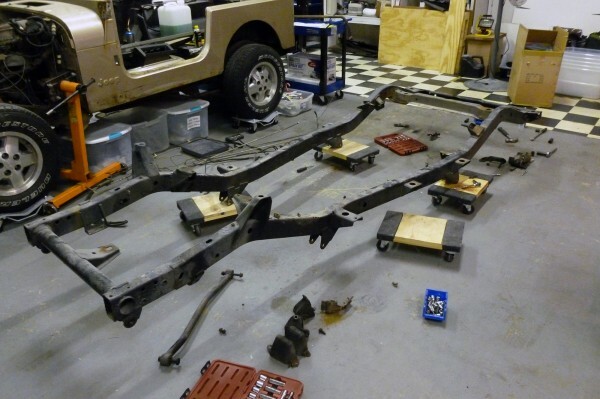 We immediately found a great Jeep frame here in Colorado from a local Jeep builder. 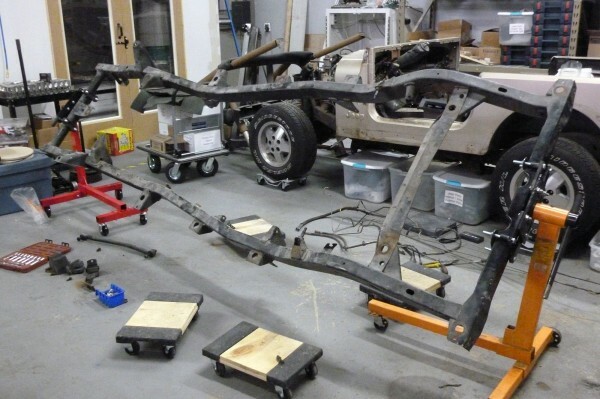 The frame will alleviate a lot of the problems we’ve been having with rust, and will be a perfect frame for a restoration. 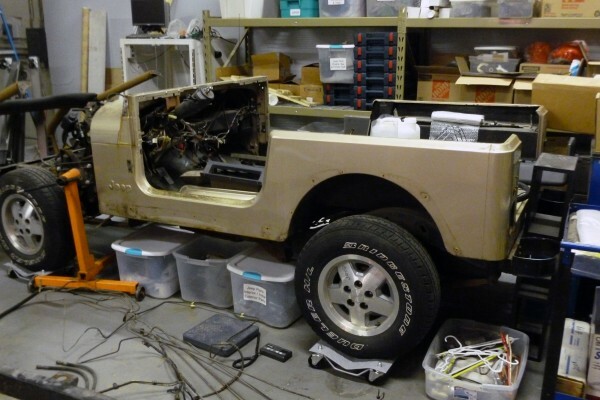 We’ll be taking the body off some time this Summer and swapping the body over along with the engine. 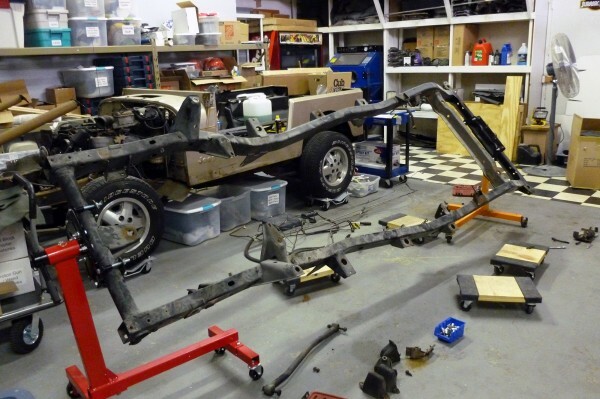 The suspension will be replaced with new leafs that will give a modest 1.5″ lift. 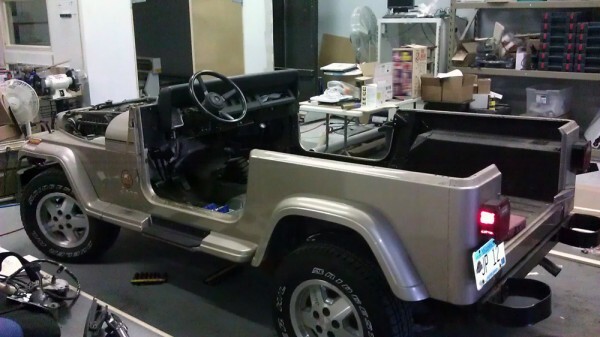 While the body is off, some body work will be done, and parts will be painted and rhino lined. 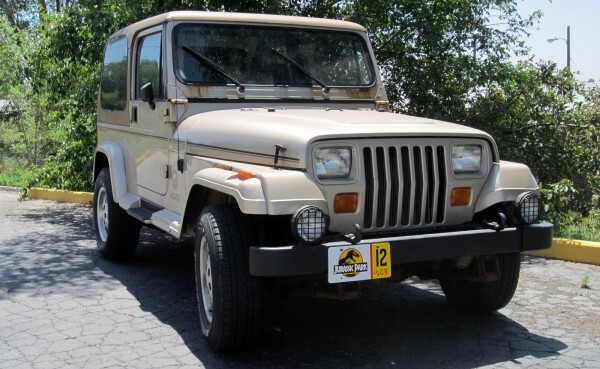 We hope to do the actual painting and Jurassic Park conversion on this Jeep over the winter. A few weeks ago while driving the Jeep, the power steering lines completely rusted through and drained the lines in a parking lot. 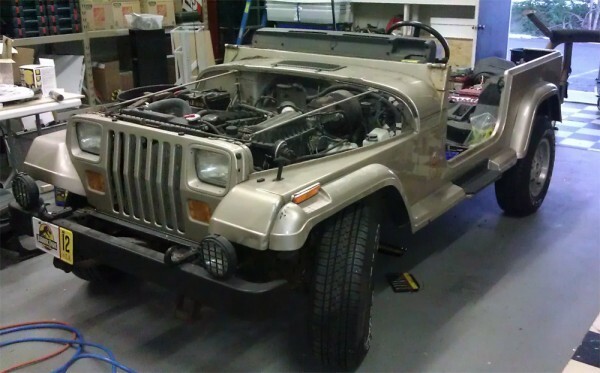 Without easy steering, I parked the Jeep for a few weeks until I could get the parts and a nice enough day to do the repair. 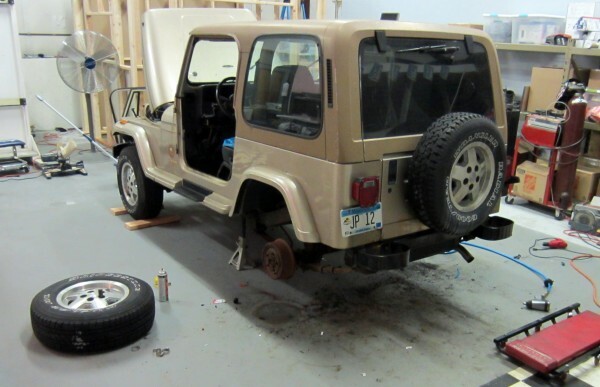 Figuring out a way to get the power steering lines out prooved to be a little more work than you would anticipate for a Jeep having the steering box OUTSIDE of the front bumper. 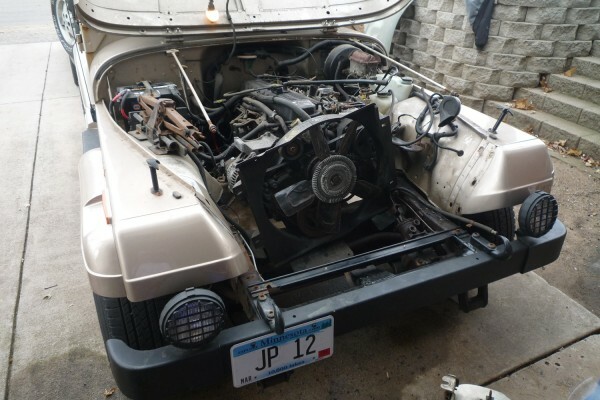 I ended up having to completely remove the front grill and core frame in order to gain access to the lines. 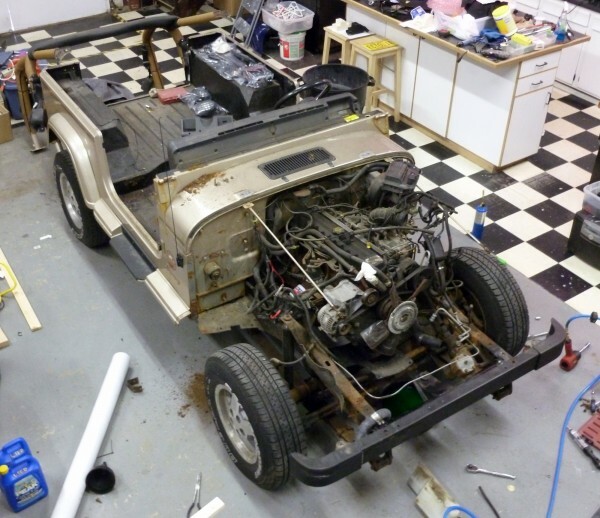 It may have only been 12 bolts, and removing the radiator but it brought along its own headaches. Kinda cool. 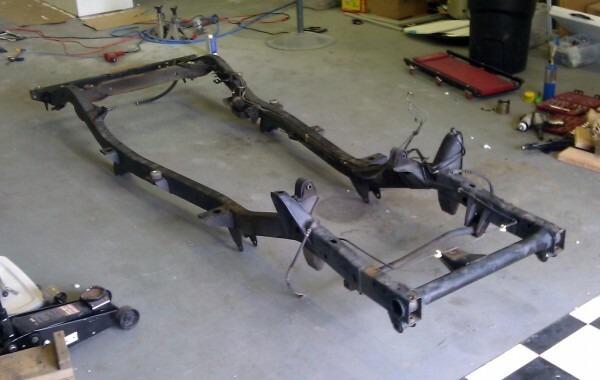 I’ve never had a vehicle with a main frame so you could just remove a large chunk of the front end. If the Jeep weren’t so rusty, working on this thing would be a snap. The bad news though was that the radiator was on its last legs. The fins were all rotted away. I was surprised it worked at all… not something I was willing to test with Winter approaching. 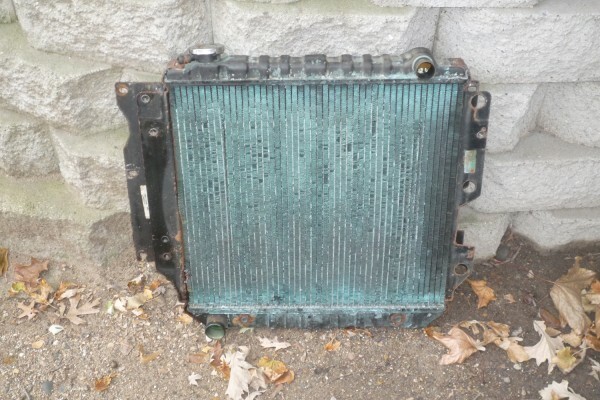 A new radiator was ordered along with all new hoses and bolts. But that wasn’t the least of the troubles. The main body mount for the front had completely rusted through the frame. A quick patch panel was made and welded up. Looks pretty nice? Gotta try and get it all back together tomorrow morning as long as the 40 degree day isn’t bombarded with snow or rain showers!